For this refreshing drink, we combined fresh squeezed lemon juice and a quick sugar syrup. Fresh mint ice cubes add a hint of crisp flavor. For the sugar syrup, bring water and sugar to boil in saucepan, stirring occasionally, until sugar dissolves. Pour into bowl. Cool. Microwave 5 or 6 lemons at a time on High 1 to 1-1/2 minutes, just until warm to the touch. Cut lemons in half and squeeze juice. Discard seeds and transfer juice and pulp to a large pitcher. Repeat with remaining lemons. Stir in cooled syrup and water. Measure 1-1/2 cups lemonade mixture in a 2-cup glass measure. (Stir sliced lemon into remaining lemonade mixture; cover and set aside.) 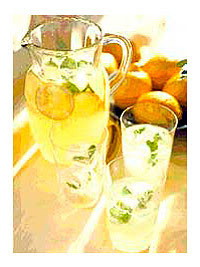 Arrange one sprig of mint per cube in an ice-cube tray; pour in the 1-1/2 cups lemonade mixture. Freeze the lemonade ice-cube tray 4 hours, until firm. Cover and refrigerate lemonade. Pour lemonade into tall glasses over ice cubes. Makes about 2 quarts (8 servings). Calories 170, Total Fat 0 g, Saturated Fat 0 g, Cholesterol 2 mg, Sodium 2 mg, Carbohydrate 47 g, Fiber 0 g, Protein 1 g.
This entry was posted on 2:37 AM and is filed under Drinks . You can follow any responses to this entry through the RSS 2.0 feed. You can leave a response, or trackback from your own site.